This has been an awesome adventure so far, and I’m not nearly done. I wish I’d discovered my love for costume making when I was a teen. 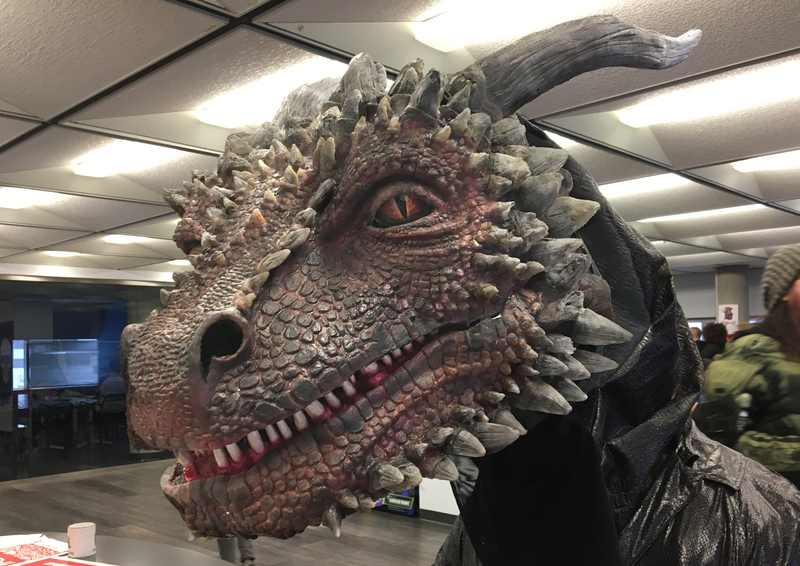 I usually do crazy hair and sew fancy gowns for Halloween, so when a co-worker commented that I’d likely do something ridiculous like make a dragon, I accepted the challenge. 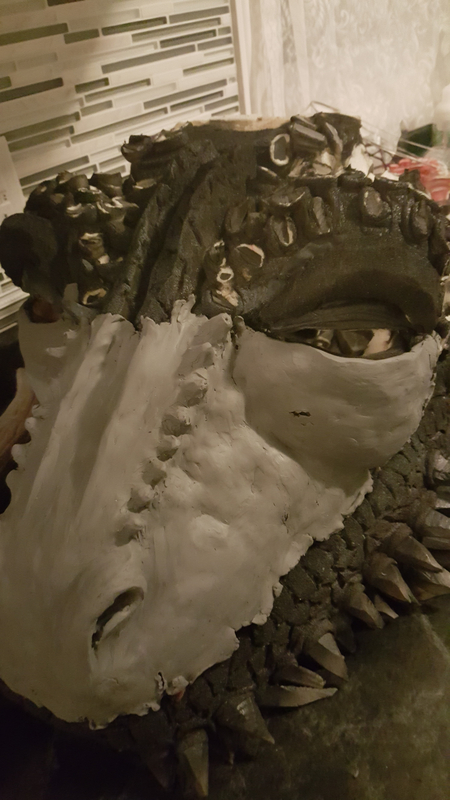 Below is the final mask that I wore to work today for our anual halloween party. 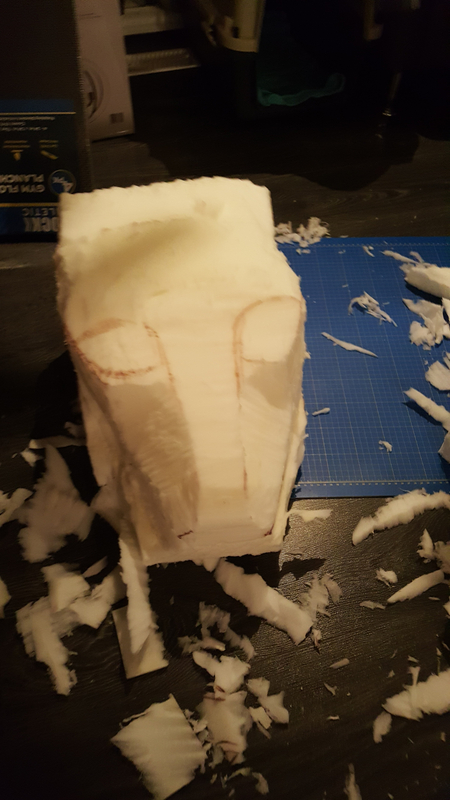 I want to use what I"ve learned so far and make a whole HUGE body that is in scale with the mask. After this I'll add the "in progress" images. Below is a good size comparison. 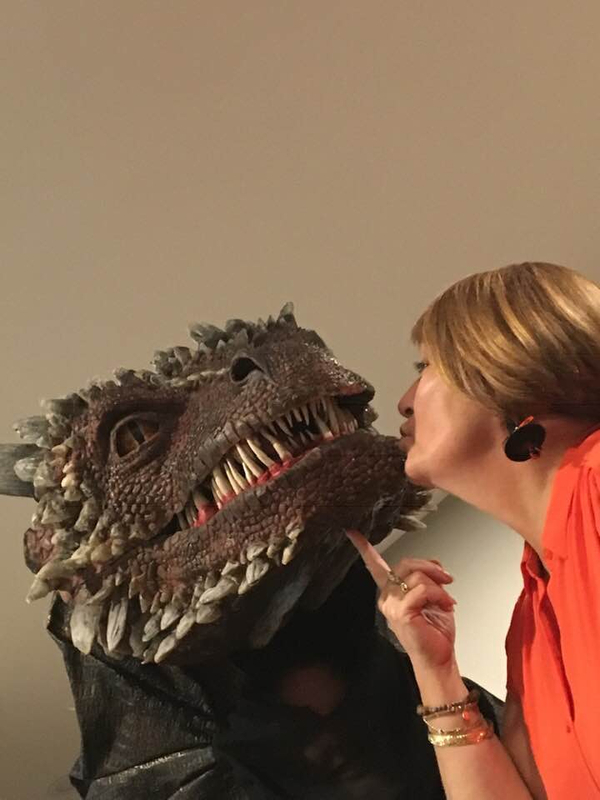 My neighbor wanted to kiss the dragon for some reason. 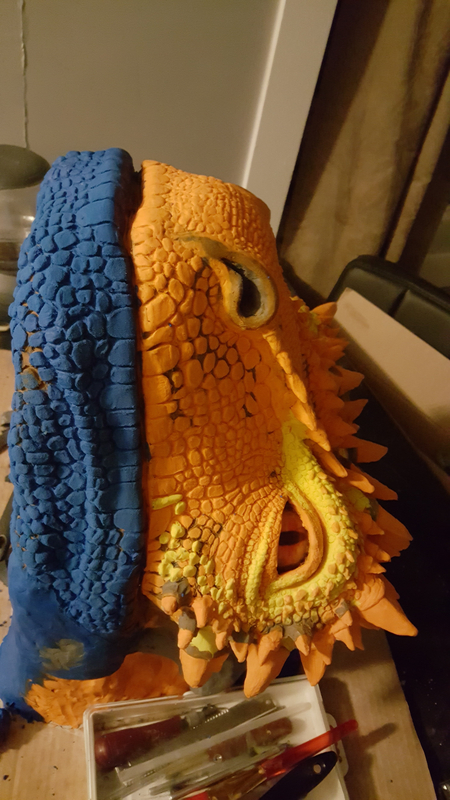 Learning as I went I originally sculpted the head out of upholstery foam. It wasn’t until I’d finished that I realized the weight of it and that my neck could never support it. 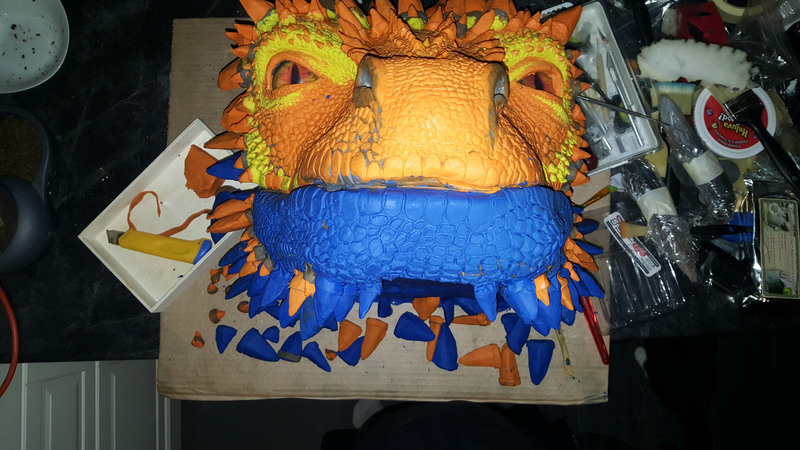 Back to the drawing board, I sculpted it again out of plasticine (all I had lying around). 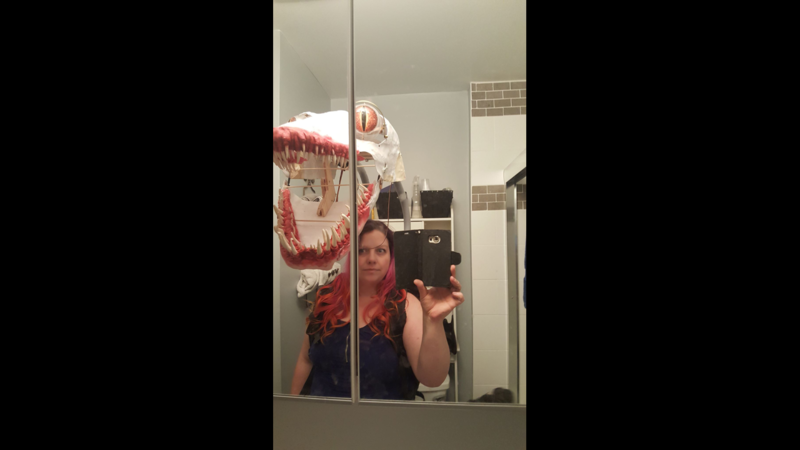 I made my mold and with some trial and error, was able to make a cast of what I wanted. 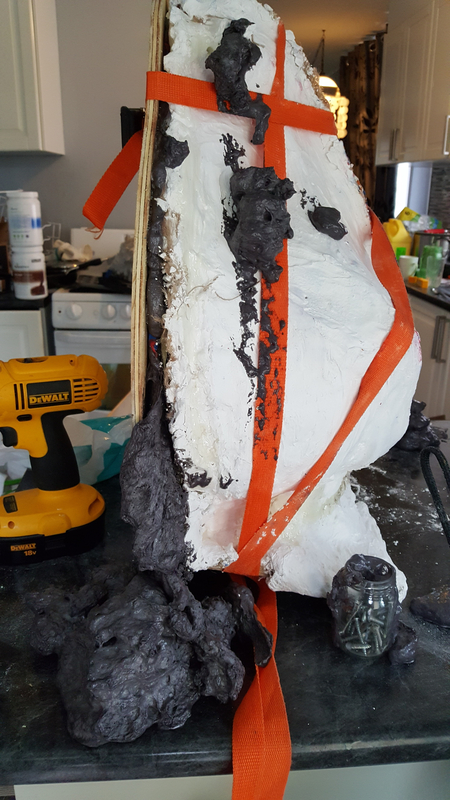 This mask is made of flex foam it with a skin of latex over an under skull I had vacuum formed from my casting. 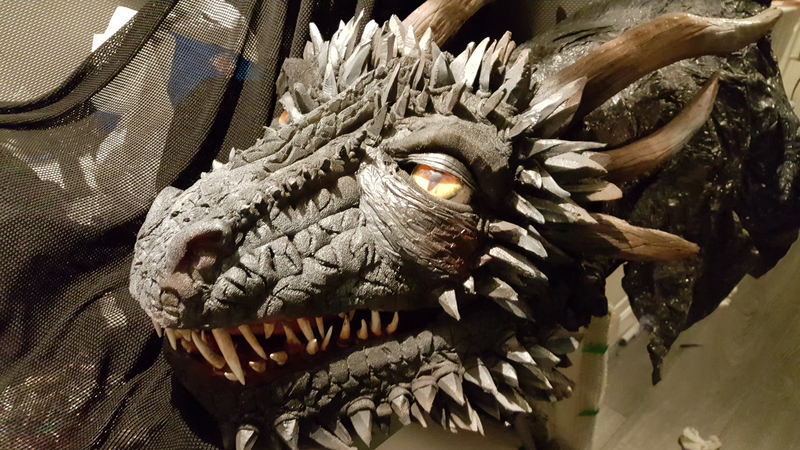 Eyes I made in photoshop, printed, and encased in a Christmas ordainment with polymer epoxy. 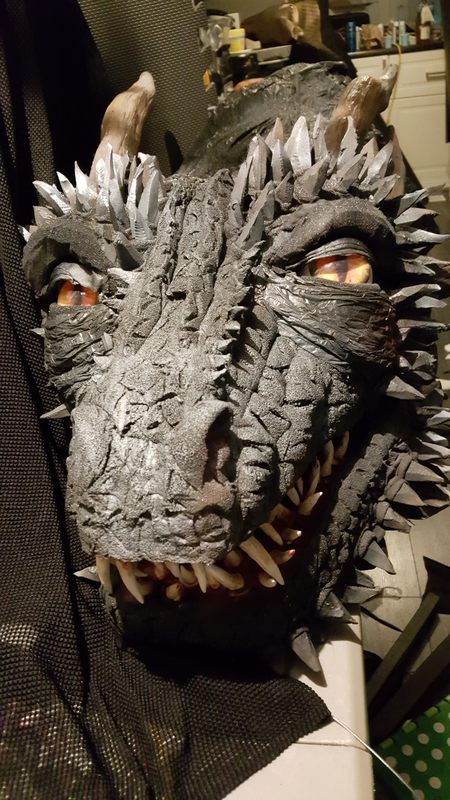 Although the eyes and jaw were designed to function with servos, I’ve run out of time to program them, so I’ve created a cable mech that I can control with my hands inside my dragon gloves. A pack frame is successfully holding the weight of the head with no strain on my neck! Yes it's pretty creepy without the skin on. 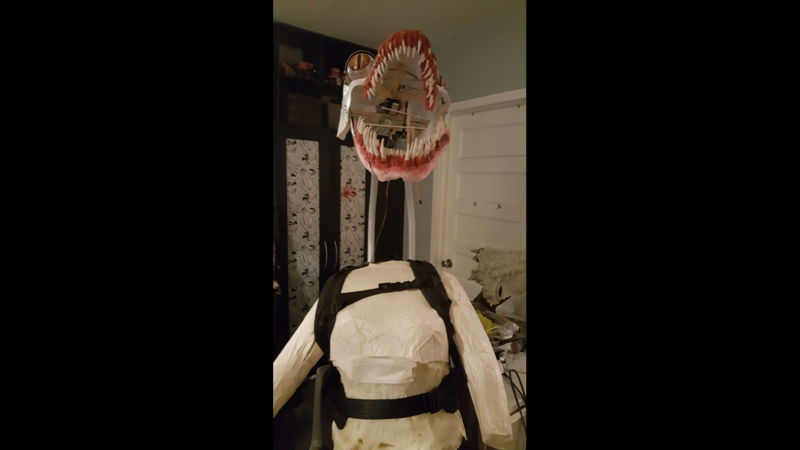 Still a work in progress, I’ll be painting in the next few days and added some springs and bungee’s to help with holding the neutral positions. 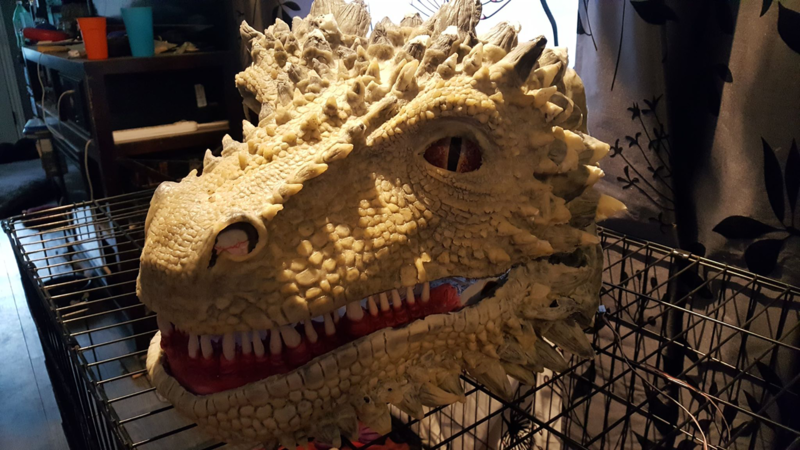 I have prototypes for the full scale 15ft dragon, but that’s for next year! I made a video, but can't figure out how to post it. If you have any suggestions i'd love to hear it! Always wanting to learn something new. 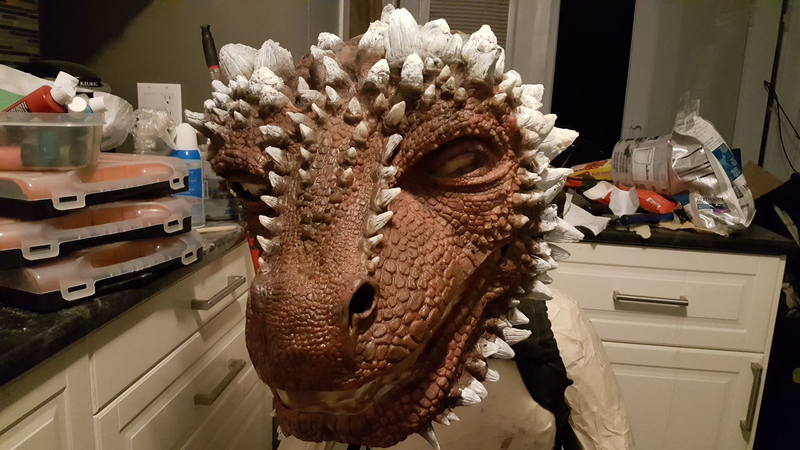 Wow, you really made good progress on this costume, I can't wait to see the finished version. The painting begins! Now if only the airbrush would co operate and not clog every 3 min. I maybe doing it wrong as I'm new to it all. Wow that's amazing! Can you control the mouth opening and closing? Thanks! 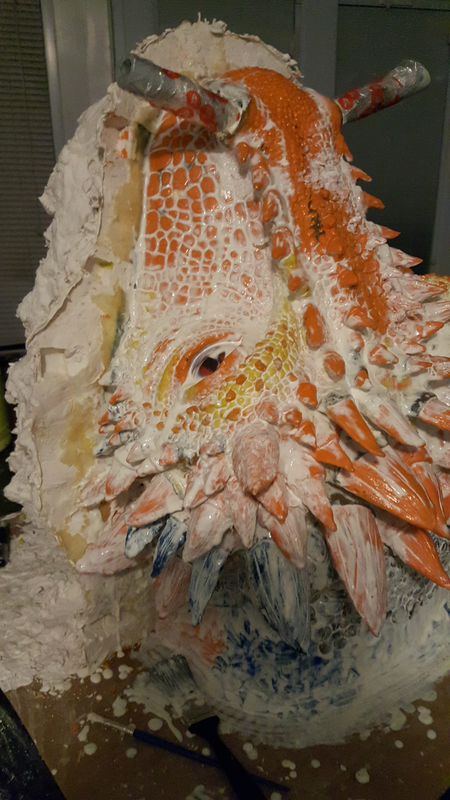 The jaw open close and eyes are controlled by servos. 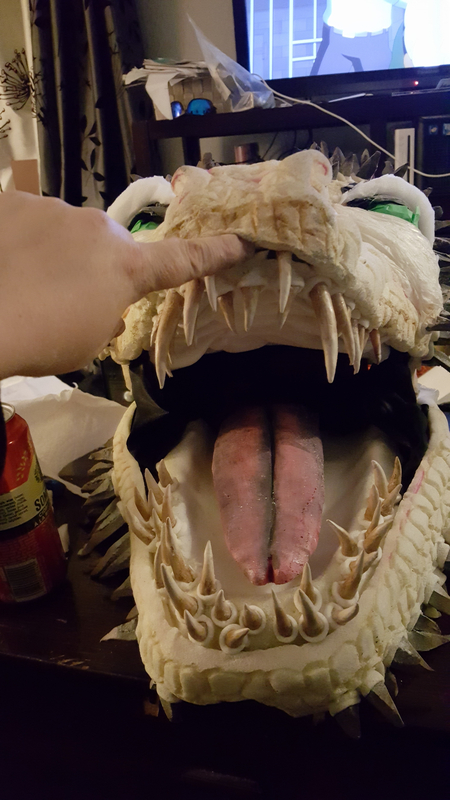 I think next time I want to try a lip wire and make him snarl too.